Stability, quality and ease of use are what most users consider when shopping for a juicer. A good juicer should be economical in space and power efficient. Most juicers in the market don’t meet all the standards looked for by the customers. Juicers producing high-quality juices produce a dry pulp and operate at low noise. They also have standard warranty guaranteeing their quality. Among the few juicers in the market recommended and met this requirements sis the omega VRT 350 heavy duty dual-stage vertical single auger juicer. The juicer is available at Amazon and other commercial sites with shipping available. The Omega VRT 350 heavy duty dual-stage juicer is a uniquely vertical designed juicer to take less kitchen space. Unlike its omega predecessors, this unique product design eliminates the need to keep it way after use. It can comfortably be kept close to the blender or food processor since its design uses minimal space. The product low rotation speed reduces heat buildup allowing the juice to flow naturally. Therefore, the juice retains all the nutrients from the pulp together with the highest taste. The omega vrt350 heavy duty Dual stage juicer has the following features. • The new product has a stronger heavy duty screen. • Lighter- weighs 17 pounds and 18 pounds as shipping weight. The product has a unique specification and features rating higher than other blenders in the market. It has received a higher positive feedback on commercial sites like Amazon. Most of the users using the juice blender recommend it with a favorable feedback. The machine has low work rate that may go well with some users. For users with no issues with its slow work rate, the machine is easy to operate. It doesn’t require complete dismantling for cleaning. The auto cleaning system just requires the user to add water and the product auto cleans itself between juicing runs. The juicer is slowly pushed down to the VRT 350 after chopping the pulp and the juice is ready for drinking. The Omega VRT 350 is very easy to clean. Unlike the other Omega models that required the user to dismantle for cleaning, it has an automated cleaning system. The user is only required to rinse in water just like the normal juicing procedure. The product regularly requires dish washing treatment after juicing cycle. Other than prolonging the juicers life, it also sustains good hygiene and a high-quality juice taste. The quality of the juice produced from the Omega VRT 350 juicer is of outstanding quality. The quality of the juice depends on the pulp quality. The juicer produces high-quality comparative juice than other juicers when the same pulp quality. The quality of the juice is best in fruits like apple and grapes though it also processes the wheatgrass. The product is designed to provide optimal results with little power output. Besides the vertical design being a limitation to the amount of power it can generate, it’s considerably better than other juicers. It maintains an 80 rpm speed that is sufficient for churning even the wheat grass. It has an advanced noise reduction system making it’s the top in the market. The juicer is less noisy than the current blenders or food processors in the market. The Omega VRT 350 has a good recommendation in little noise for users requiring minimal noise from their juicers. 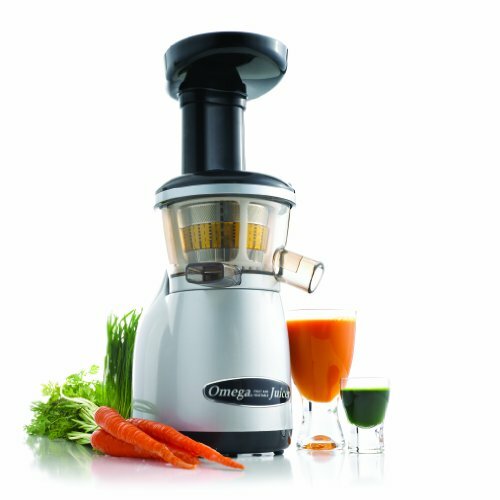 Considering the juicers slow nature, it can produce and store several litres of juice for up to 72 hours. The juicer produces a dry pulp that is an indication that its yield is optimum. • It has a compact vertical design that occupies less space. • Saves Power and yet efficient. • Comparatively lower versatility than more massive masticating juicers. The Omega VRT 350 is smaller and less expensive than previous Omega juicers. Besides, it’s more efficiency and user-friendly to use. It produces less noise and, therefore, ideal for a quieter environment. Other than the high-quality juice it produces, the Omega 350 gives optimizes the pulp with no loss. The product has the coolest design that is space economical and probably the best juicer in the market. In additional its ten-year warranty guarantees its good quality. It produces a high quality with a wheat grass that is not common with other juicers.